With the mail.com Virus Protection feature you are protected against infected e-mail. If an e-mail to you is intercepted, you will receive an e-mail informing you of this. The mail.com Virus Protection feature checks all incoming and outgoing mails, including attachments, for viruses fully automatically. 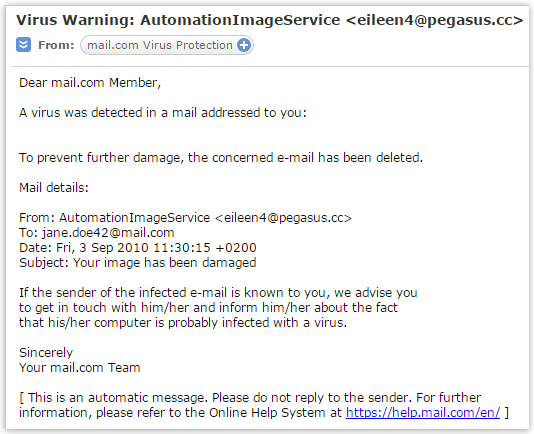 Infected e-mail are deleted. If an email addressed to you is intercepted, you will receive an e-mail informing you of this. Virus Protection is activated by default in your mail.com mailbox. You can deactivate virus protection via E-mail → Settings → Mail Security. Use this setting in exceptional situations only. If you do that, please make sure your computer is already running appropriate virus protection.